So a few months ago you listed your home with the excitement that soon you would be moving. Weeks pass, then months pass and you're home still did not sell. Your excitement quickly turns into anger but do not get frustrated, Tiffany Holtz Real Estate Group is here to help you. With our aggressive marketing program, a huge database of motivated buyers and professional listing services we sell homes twice as fast as the average agent in our MLS and we sell homes for an average of 2% more money! Take a look at the family above, The Harvey's. They listed their home with an "average" agent and their home sat on the market for 133 days with NO offers! 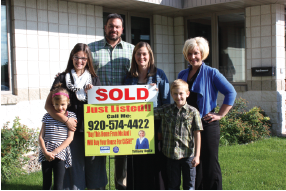 They then contacted us (through our strategic marketing efforts) and we listed their home and sold it in 12 days for 99% of the asking price! (MLS average is 96%). So please contact us by filling out the form below and become our next Success Story!